I feel like I’m moving up in the world. Lately the blog has been getting more well known and talented people showing up here. I confess to nerves getting to talk with Barry Reese. He has become an accomplished writer in his own right, creating the worlds of Lazarus Grey, Gravediggers and The Rook. The icebreaker for me with Barry was his fandom of Valiant comics – something I share as well. We talked shop for quite a bit and then proceeded to the interview. Barry’s style feels nostalgic – he’s a throwback to simpler times and tells compelling, entertaining pulp that tends to border on horror – especially in his later works. Whether you read Rook, Lazarus Grey or Gravediggers, you will get your monies worth. I wanted more when I finished the Rook and am doing so by purchasing Lazarus Grey and Rabbit Heart. I may have to talk to Barry again about the last one. Finally, I thought it was fascinating that all of Barry’s works are connected and part of a shared universe. The Rook, Gravedigger and Lazarus Grey all are part of the same world and universe. I talk to Barry about each series and how all of these are connected and more. J oshua Pantalleresco: When did you decide to become a writer? Who were your influences? Barry Reese: I’ve always wanted to be a writer – creating stories was something I did even as a small child. Growing up, I was a huge fan of Robert E. Howard, Chris Claremont, Marv Wolfman, Edgar Rice Burroughs, Michael Moorcock and Gerry Conway. When I got older, I became a follower of Paul Ernst, Frank Herbert and Walter Gibson. BR: I love the honesty of pulp. It is what it is – escapist entertainment. In particular, the hero pulps were tons of fun because you got to see people who did the right thing because they knew it was the correct path to take. They gave everything they had – sometimes their entire identity – to make the world a safer place for innocents. JP: For those of us unaware, tell me about the Rook. BR: The Rook is Max Davies, who witnessed his father die at the hands of criminals. Haunted by his father’s spirit after this event, Max is sent visions of future crimes and is forced to become a hunter of criminals. In essence, he becomes his father’s living vessel of vengeance on earth. 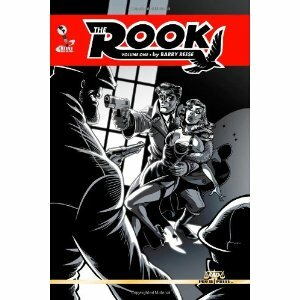 That’s the setup as of the very first Rook story and things progress quickly from there – unlike most classic heroes of the past, The Rook’s setting and supporting cast change wildly as the series progresses through the years. So far, Max has starred in six volumes of his own series, been the focus of two anthologies and guest-starred in a variety of other books. JP: Is the story over, or will there be more sequels with the character? BR: I’ve learned to never assume that The Rook’s saga is over – every time I’ve thought “this is it,” there’s usually another one on the way! Fans of the character will Tales of The Rook Volume Two in a few months, where other writers get the chance to handle the character. He’ll also pop up in a crossover novel where he’ll team up with Lazarus Gray and Gravedigger in the next year. JP: Speaking of Lazarus Grey, what is that story about? BR: When the series starts, his identity is a mystery, even to himself! Washing up on the shore of Sovereign City with no memory of who he is, our hero soon finds himself the target of assassins. The only clue to his identity is a small medallion with the words Lazarus Gray etched onto one side. Deciding that by adopting the name, he might draw out someone who knows of his past, he does just that and establishes Assistance Unlimited, a group devoted to helping those in need. With his team of trusted agents, Lazarus defends not only Sovereign but the entire world from threats such as The Illuminati, the immortal Princess Femi and the diabolical Doctor Satan. JP: Finally, tell me about the Gravedigger. BR: Charity Grace grew up on the wrong side of the tracks. Doing whatever it took to survive, Charity became a petty thief… until the night she broke into the wrong house. Killed by the mysterious man who lived there, Charity was revived by something called The Voice, who offered her a second chance at life if she agreed to become its agent of vengeance on Earth. She accepts but there’s one more catch: she only gets three years before she’ll be judged by The Voice. If she’s redeemed her soul, she’ll be rewarded… but if she’s found to still be wanting, eternal damnation awaits. Discovering that she’s the first woman in a long line of warriors known as The Gravediggers, Charity must become Sovereign’s grimmest defender. JP: You have Gravedigger, The Rook and Lazarus Gray crossing over. Does that mean all your stuff has a continuity to it ala comics? Or something along the lines of what Stephen King did with the Dark Tower? BR: They all exist in the same universe, yes. At the back of each book is a detailed timeline showing how it all fits together! JP: To date, what is your favorite story you’ve written? BR: That’s tough… I really thought the first two Gravedigger books (only volume one has seen print yet) were good and I think Lazarus Gray Volume Four (coming soon) is also a fun read. JP: What is your advice to writers trying to get into any industry? BR: Network! Meet other writers and editors. Make friends with them. Honestly, that’s very important. Also, very few people are Stephen King. Most writers are not making a lot of money… go into it because you love to write and write what you love. If financial success and fame comes along, that’s wonderful – but don’t let that be the thing you’re chasing. JP: What’s coming up next for you? BR: I work so far ahead that the things I’m writing now may not see print until 2015 or even 2016! But people can expect to see Lazarus Gray Volume Four and Gravedigger Volume Two this year, along with a G-8 and His Battle Aces story from Moonstone. For further information about barry, check out his webpage at Http://www.barryreese.net where he updates with news and blogs on a regular basis. His twitter handle is @BarryReesePulp and you can sample some of Barry’s many wonderful works at either his website or his Smashwords Page right here. We only talked about the tip of the iceberg – Barry has accomplished a lot of great work in a short time. I encourage you to check it out. Finally, if you have enjoyed this interview you can check out my book The Watcher at my own Smashwords page. Thanks for reading.